A low in the monsoon trough over the Gulf became a rain depression and drifted South and East until it settled over Townsville, where it stayed much longer than “normal” (we will have to return to that concept later) and dumped an inordinate amount of rain on us over about ten days – say 29-30 Jan to 7-8 Feb.
Variations on this pattern bring our heaviest rainfall episodes – even more rain than cyclones, contrary to most residents’ expectations. One of them, for instance, brought nearly half of last year’s rain. The Night of Noah, Jan 1998: whether the flooding this time was worse than that event depended a lot on where you were, but the events were broadly comparable. Cyclone Althea, 1971: similar levels of flooding but (importantly) before Ross Dam was built. That suggests that both 1998 and 2019 would have been far worse than Althea. Before that, 1946 and 1953 are mentioned; but in those days, Townsville was less than a fifth of its present size. • An active monsoon trough and a slow-moving low pressure system over the northern tropics produced extremely heavy rainfall in tropical Queensland from late January 2019 into early February. • In and around Townsville, the accumulated totals from consecutive days of heavy rainfall set many new records. The highest weekly accumulations were comparable in terms of geographic spread, duration, and intensity of rainfall to those of January 1998 and January 1953. 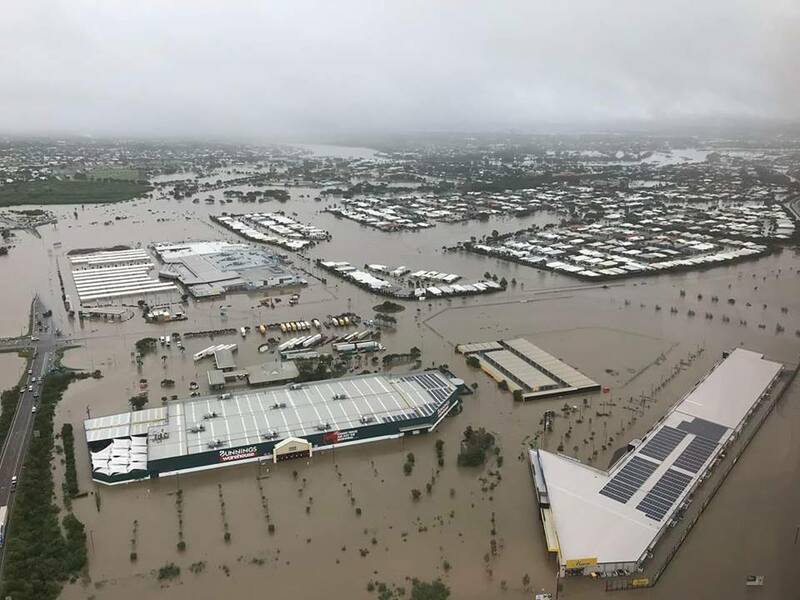 • In the seven days to 4 February 2019, the Bureau’s site at Townsville Aero recorded 1052.8 mm, and 1259.8 mm in the ten days to 8 February. Prior to this event, the Townsville record for a 7-day period was 886.2 mm (January 1998) and for a 10-day period was 925.5 mm (January 1953). • There were several sites in elevated areas including Paluma, Woolshed, and Upper Bluewater that reported 12-day accumulations of more than 2000 mm. • In the Gulf Country and North West Queensland, record-breaking rainfall also occurred in previously drought affected regions, including at Julia Creek and Richmond. If you want more information but the statement’s thirty pages of data seems too much, ABC News reported on the climate statement here. Climate Change, aka Global Warming, is a proven theory about long-term changes in our weather patterns. We have the data to show that, for instance, Townsville’s average annual rainfall has been falling for decades. Quite frankly, we need the data for this job, since our rainfall varies so much from one year to the next that picking out longterm patterns is almost impossible without it. But climate change is not just a matter of changes in long-term averages: it also supercharges short-term events. Saying that a particular event is “due to” or “caused by” climate change is rarely justified, but saying that it “was made more likely” by climate change may be valid. In fact, there’s a whole subsection of climate science, attribution theory, which studies the subject; this US site introduces its key concepts. 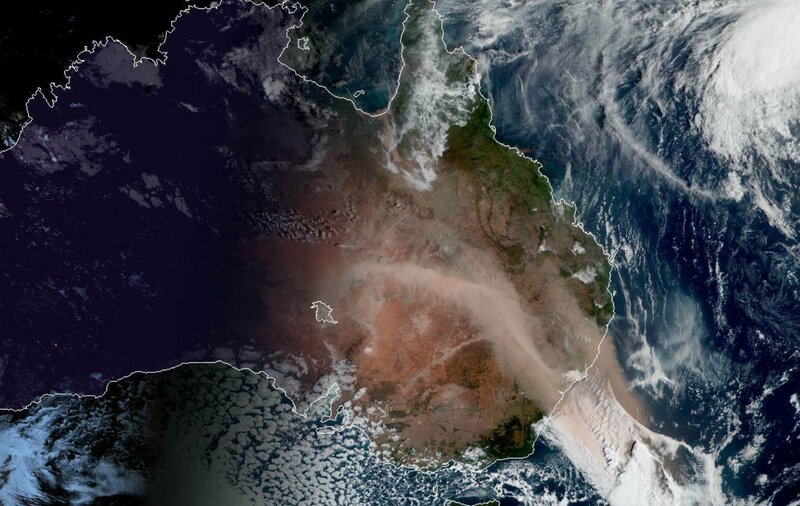 An enormous streamer of dust from NSW into western Queensland, while the Flinders River floods cover much of the Gulf country on 14 Feb. Ten days after the peak of the rain, Western Qld still featured a river 200 km wide, Townsville people were still dealing with the mould – and worse – but there was so much haze in the air at midday on Feb 14th that Mount Stuart was barely visible from Mundingburra, a distance of four or five kilometres. Why? Dust was blowing up from the south-west, from inland NSW and southern Queensland. And six weeks later, around March 22, we had two cyclones at once in the Top End. Trevor approached from the East, crossed Cape York Peninsula, re-formed in the Gulf and crossed the Southern coast of the Gulf on March 23 as a Category 4 storm to dwindle into a rain depression as it drifted SE. At the same time, Veronica was approaching the Pilbara from the Indian Ocean as a Category 3 system. Published numbers vary but, really, 100% is the correct answer. Many people lost a lot of their worldly possessions – cars and bikes, couches and fridges, carpets, teddy bears and computers, if not their whole house. And those not directly affected either at home or at work helped out flooded friends and family, or had to cover for flood-affected co-workers, or struggled to find child care because nearly all schools were closed, or couldn’t buy groceries because shops were shut and roads cut. Some of these consequences will be described in a separate post, Townsville’s 2019 floods – consequences in daily life, now in draft form. Household cover sometimes includes floods from rivers and/or rainwater run-off, sometimes covers lost rent, extra living expenses up to and including temporary accommodation. It never covers the time spent by owners or tenants in cleaning up the mess – usually many hours – although it may cover cost of materials (e.g. paint). I saw some evidence of tradespeople quoting for work which wasn’t strictly necessary, and of course the delays caused by the huge volumes of claims and repair work added a hidden cost for many of us. Natural justice was nevertheless sometimes achieved. For instance, the new-for-old cover on some very old house contents could go some way to compensating us for our hours of cleaning and repairs. However, I’m sure we’re going to see the insurance payout reflected in increased premiums in the near future. Getting the $1000 disaster relief payment was not difficult and the money was certainly welcome. Most of us us will spend it immediately on replacing goods lost in the floods, so it will be a big boost to the local economy – around 50,000 people by $1000 each is a $50 million cash injection in a city which has been in the economic doldrums for some time. One can almost see Townsville Enterprise and the City Council celebrating the news. But are we, the people, actually any better off? No. The $1000 vanishes into replacing stuff (and usually won’t replace all we’ve lost) and we’re really back where we would have been without the flood – but tireder, because we’ve all spent so many hours cleaning up the mess. In the nearly-thirty years I’ve lived in Townsville the city has grown from roughly 150 000 to 220 000. Much of the new housing has been built on land previously considered unsuitable because everyone knew it was flood-prone. “Wouldn’t build there!” the locals would say … except for the Council officers who saw the $$ signs and let the developers go ahead. “Wouldn’t buy there!” the locals would say – but people new to town (or too young to heed the stories of earlier floods) would go ahead anyway. Idalia is the stand-out example. It always was a flood plain and, sadly, became one again. There is a lot of anger in the community about the fact that development was ever approved there, and some disquieting rumours about the approval process. This aerial photo (from facebook, so I can’t credit the photographer – sorry) looks West along University Road over Fairfield Central shopping centre. Ross River, near Fairfield Waters shops, is in the centre-distance and Idalia is on the right of the picture. Hermit Park was badly flooded, too, but it’s a much older suburb and most of the houses there were built for the conditions, unlike the generic-modern low block houses in Idalia. Possessions were lost but far fewer houses will need to be demolished than in Idalia. All of the newer suburbs contributed to the severity of the flooding for another reason, too: big houses on small blocks mean that there is little open ground to absorb the rainfall, so it all has to run off into the stormwater drains, the streets and, eventually, the rivers. The Disaster Management Centre set up by Townsville City Council issued a media release as early as Feb 7 which said that, “the flood levels in the Ross River were greater than a 1 in 500 year event,” and, “There were rainfall totals over parts of the Ross River Dam catchment during the past week that were in excess of 1 in 2000 year rainfall events,” but both claims are dubious in the light of climate change. There have been suggestions that management of the Ross Dam contributed to the flood damage because of delays in opening the dam gates, i.e., the gates should have been opened earlier. Many were reminded of the handling of Wivenhoe in the 2011 floods. There have also been suggestions that the weirs, (Black, Gleeson’s and Aplin’s, should have been removed years ago so that any flood water released from the dam could get away immediately, and indeed that there was a 2010 flood mitigation strategy report to that effect. It seems reasonable, especially to someone like myself who saw the floodwaters backed up behind Aplin’s Weir spreading into Aitkenvale via Thompson St.
Wally’s Weather’s retrospective has a few recommendations for better flood management. Brian Gunter makes rainfall comparisons here and discusses the consequences of different dam water release options. Townsville floods show cities that don’t adapt to risks face disaster on The Conversation. The Conversation has a series on Australia’s weather hazards, indexed here. This one is about medium-term weather patterns which change the flood risk in SEQ; it doesn’t talk about the tropics but the possibility that similar patterns are yet to be discovered here is intriguing. This brief article on Wikipedia has some useful links. A photo album collected at the height of the emergency. The tropical low on the monsoon trough continues to move east over the Coral Sea, taking much of the heavy rainfall which caused widespread flooding in Queensland with it. While sunny conditions have returned for much of the state, satellite images reveal the extent of the flooding on the Flinders River where tragically, widespread agricultural impacts and stock losses have been reported. Flooding in the Flinders, the longest river in Queensland which feeds into the Gulf, is the most significant we have seen in more than 50 years, with flooding likely to continue well into next week. That is from a BoM press release. 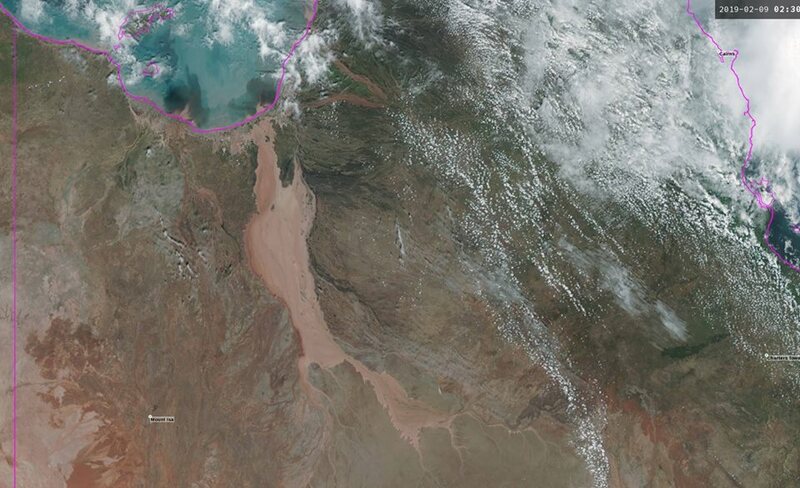 Floodwaters across the lower Flinders River have continued to very slowly ease, based on satellite imagery. Major flooding will continue along parts of the lower reaches of the Flinders River during Sunday and into next week. The Flinders River has experienced its most significant flood in at least the last 50 years. Record floodwaters in places has also broken out into adjacent catchments. It is recommended to look at satellite imagery (http://satview.bom.gov.au) to appreciate the full extent of the flooding in and around the Flinders River area, particularly the lower reaches of the Flinders River which extend into the neighbouring catchment area of the Norman River. The satellite images associated with the press release and warning seem to have been taken down but I saved one, virtually a close-up of the NOAA image above. Flinders River flooding into the Gulf on 12 February (BoM image) Scale: approx 1000 km from one edge of the map to the other.